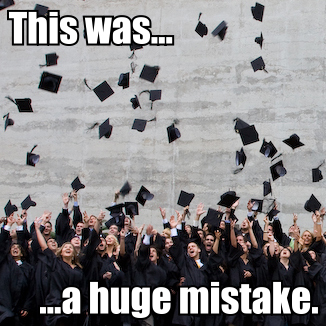 The Last Several Weeks (Part 2):Why I did not attend Commencement. In January of 2010 I left my job, my family, and my recovery community to come to Fuller Theological Seminary for two basic reasons. First, I came to earn an M Div degree with an emphasis in recovery ministry in preparation for full-time work in a Christian church. Second, I came to continue my relationship with my then girlfriend who I was thoroughly convinced I was going to marry. I essentially came to Fuller thinking my career and my family, two rather major decisions and facets of one’s adult life, were going to be settled by the time I left. While I have had some good experiences and have grown as an individual, after two and a half years and $70,000 dollars, not only did I fail to achieve these two goals but things actually became worse in many ways. In regards to the degree, seminary is a place where future Christian leaders receive specialized training in preparation for future jobs in ministry. However, seminary for me was quite the opposite. Seminary was the place where I realized most of what I was taught about life and faith by the Christian church has been wrong, where I gave up pursuing full-time ministry work, and where I stopped identifying as a Christian. This is like a medical doctor went through all of medical school only to realize that they do not want to practice modern medicine. In regards to my Ex, after few months down here she left me with little explanation. While this this was painful for both of us at the time and has been a major source of pain, confusion and anguish in the last two years for me I see now she was right to leave me and I am ultimately glad she did. I had put incredible and impossible expectations on her because I thought she and what she represented (marriage and family) would fill the void the that cannot be filled. Several months ago she got engaged to her new boyfriend and while this was an odd emotional space for me to navigate I sincerely wish her and her fiancé all the best. These are quite obviously the opposite outcomes of my main goals in coming to seminary and they unfolded rather early in my time down here. There are two basic reasons why I stayed and finished a degree. First, I was scared. My only option if I left school was to find a job to pay rent so I could stay in the area. Going home was simply not an option as I had just started to come out of denial about my family. However, the problem is I have always felt incompetent and ill-prepared to accept such adult responsibilities and it was easier for me to take the cowardly way out, stay in school, something I knew I could do well, and have the safety net of student loans. This has only postponed the inevitable and now I still have to face those fears, only this time with a large amount of debt. Second, I foolishly hoped it would all work out somehow. I had prayed for months and sought counsel from my mentor and many pastors before choosing to come to Fuller and pursuing my Ex. Both of those decisions were widely affirmed and even confirmed by God. When things went bad I tried scripting this scenario in a variety of ways in an effort to excuse God and excuse myself from this dismal failure. I held out hope that God had some secret redemptive plan all along and would step in at the last moment and it would make sense somehow. This has not happened in any way shape or form. Considering the purpose of seminary, my goals coming down here and the present state of my life, even considering the good things that have happened since I have come to Fuller, the only answer I can produce that does not smack of denial is a firm “Yes” to both. This has been bitter pill to swallow. This has been the other punch in the one-two combo. This is yet another major life decision that I have gotten wrong. This has been yet another failed attempt at solving the problem that cannot be solved. This is another problem I have created for myself that I need to recover from. While I know no one is perfect, and I made the best decision possible when coming down here, my inability to leave when I knew the decision was wrong still seriously bothers me. I also know that the older I get the stakes for these decisions just get higher as does the cost of recovering from them. Some might say I am being too hard on myself. Some might suggest that the good things that have happened in the last two and half years make it all somehow worth it. Some might suggest in time the mysterious reason I was called to this season by God will be revealed. While there may be some truth in these statements I see such statements as well-intentioned attempts at providing false comfort and scripts to absolve myself and God of any responsibility. These options are unacceptable to me. I am, for better or for worse, a very principled man. Sometimes my principles are all I have. Part of this means that I am willing to admit responsibility and willing to admit my mistakes. Failing to do so just perpetuates such mistakes and stunts my own growth. Excusing myself by scripting this failure in some different light simply will not do. I did not miss my commencement. I chose not to go. I considered attending commencement because it is the natural thing to do after finishing a degree program and I knew it was what my family expected and wanted of me. I even checked out regalia should I decide to go. However, the more I thought about it the more absurd attending graduation became. Ultimately I chose not to go because it does not make any sense to me to celebrate my mistakes. This entry was posted in Personal Commentary and tagged bittersweet graduation, celebrating failures, disillusionment, graduation, mistakes, regret. Bookmark the permalink.